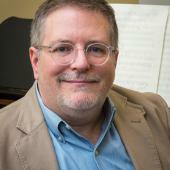 Charles Shadle teaches composition, music theory, and music history at the Massachusetts Institute of Technol0gy where he serves as a Senior Lecturer in Music and as Theory Coordinator. He is a 2016 recipient of the SHASS Levitan Teaching Award. Numerous institutions, including SUNY Buffalo, Longwood Opera, The Lake George Opera Festival, The Handel and Haydn Society, The Syracuse Symphony Orchestra, The Newton Choral Society, the Rockport Chamber Music Festival, and Lontano(UK) have commissioned his work. For the National Film Preservation Foundation he has composed six film scores, all of which are available on DVD. A career-long focus on vocal music has resulted in commissions from such distinguished singers as Carlos Archuleta, Fernando Del Valle, Gale Fuller, Jason McStoots, Margaret O’Keefe, Stephen Salters, Frederick Urrey, and Jeremy Huw Williams. Dr. Shadle collaborated with MIT colleague and librettist Michael Ouellette on two operas, Coyotes Diner and A Question of Love, as well as the cantata, A New England Seasonal. Having previously served as Composer in Residence to the Ecclesia Consort in 2000, he held the same position with Intermezzo in 2007-08 during which tie he compose the critically acclaimed opera A Last Goodbye, again to a Ouellette libretto. Major recent works include the song cycle Primordia for Baritone Jeremy Huw Williams, a Missa Brevis Sanctii Oswaldi for the Schola Cantorum of St Stephen’s Providence, Nocturne: On the River and a Third Symphony for the MIT Symphony Orchestra, and Three Chardin Fantasies of fortepiano trio, as part of “On Beethoven’s Piano” a residency cosponsored by MIT and The Handel and Haydn society. In June of 2017 the Rockport Chamber Music Festival gave the premiere of a newly commissioned piano quartet, Dogtown Common. He received his Ph.D. in Composition and Theory from Brandeis University and counts among his teachers Cecil Effinger, Richard Toensing, Barbara Jazwinsky, Martin Boykan, Yehudi Wyner, Edward Cohen, Harold Shapero and Eloise Ristad. Dr. Shadle is enrolled Oklahoma Choctaw.